I hunt them in museums, at tourist railroads, in shopping mall parking lots, in grassy fields, or wherever I can find them. I shoot them with a digital camera. Some of the images are on this site. Below is a list of the steam locomotive I have collected. Click the beside the builder's name to see the images. I also model steam locomotives in 1:20.3 scale (for our narrow-gauge garden railroad.) I have found photos of prototype locomotives an invaluable aid in my modeling. I am putting my photos on the Web hoping that they will be useful to other modelers. I have higher resolution versions of all these images. Many of the original files are 1600 x 1200 pixels. For many of the locomotives, I have additional detail shots that have not been included here. 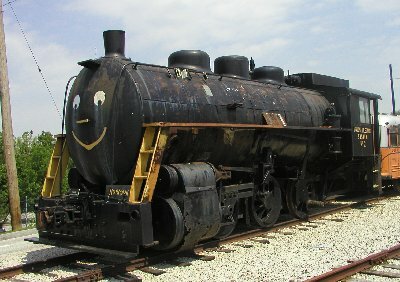 Some of the locomotives were photographed in very close quarters with terrible lighting. These shots are not works of art, but you can get useful information from them. Send me email if you want to see more images or higher resolution images. Or just send me an email to tell me what you think of the site. These images are made available for the personal, non-commercial use of fellow modelers and train enthusiasts. Anyone is welcome to link to this page. You may also include any of the images found here in your own non-commercial Web page provided you include an acknowledgement of the source. If you do link to this page or otherwise include any of my images in your own Web site, please send me email and tell me about it. These images may not be published in any print (hard-copy) format or used for any commercial purpose whatsoever without the express written consent of the photographer, Donald Nute. Baldwin 41648 1914 2-4-2 Holly Hill Lumber Company 15 4' 8-1/2" Historic Railroad Shops, Savannah, GA under restoration www.steamlocomotive.info, at some point rebuilt as 2-4-0, this locomotive is now being restored to original 2-4-2 configuration. This page last modified: 7/23/2012.